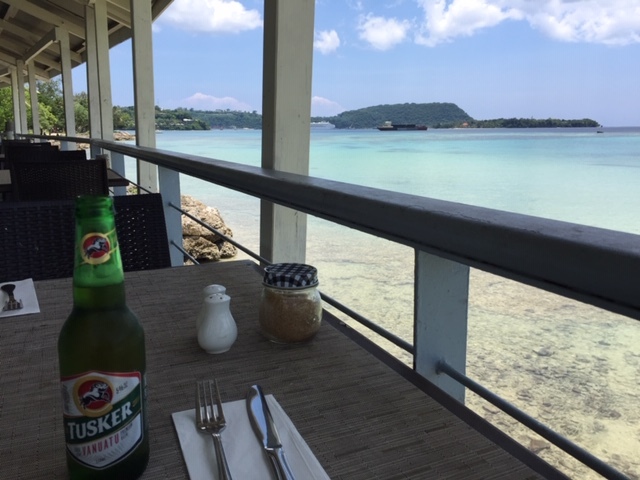 In December 2018 I spent a couple of weeks in Vanuatu for what may well be my final visit. My partner works in International Development and is like to have only one more assignment there. It is a beautiful country and claims, with some justification, to have the most friendly population in the world. 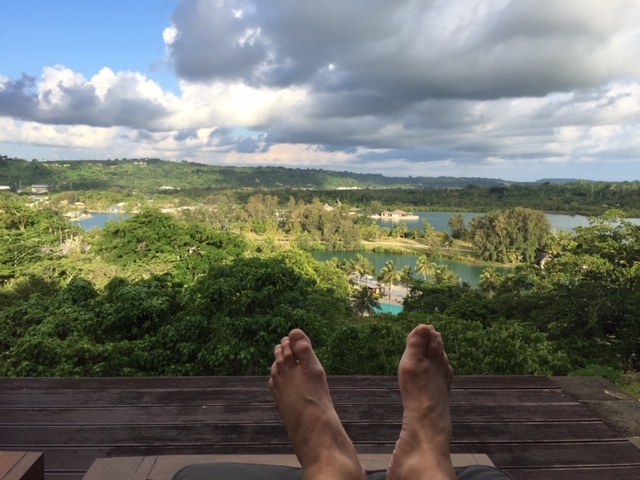 Of course, the first thing to do when arriving in a different country is to relax, particularly after such a long journey, including three flights. It’s not difficult to relax here, with daytime temperatures around 30C. 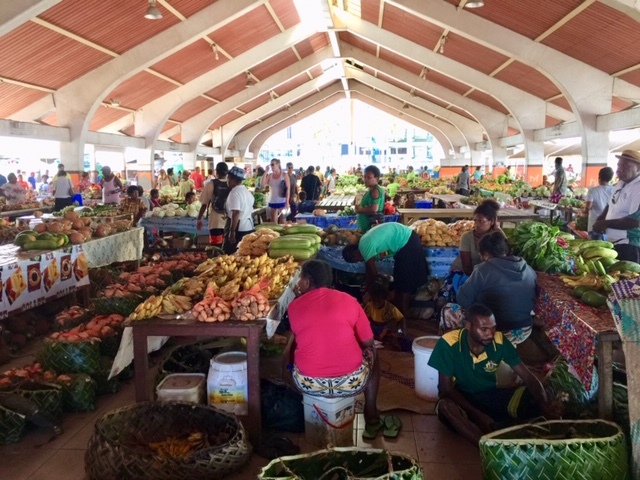 I spent this visit entirely in the capital, Port Vila. One of the great pleasures for me is to walk around the streets and to visit the twenty-four hour market. 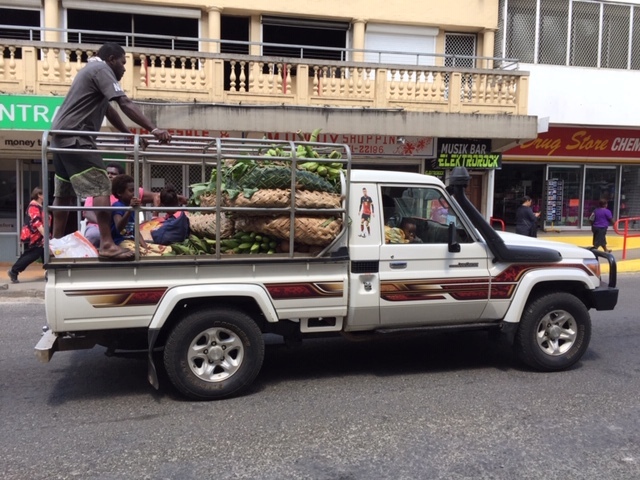 As with almost anywhere in the world, football is popular, as can be seen from the image of Ronaldo on the side of this truck on its way to the market. I have probably taken hundreds of photos of the market with its vibrant colours. The fruit and vegetables are so fresh and are amazingly cheap. 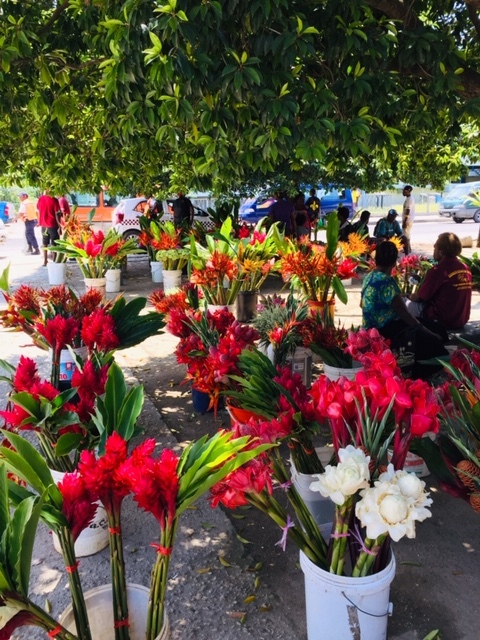 On the street, outside the market, flower sellers display their own local produce. 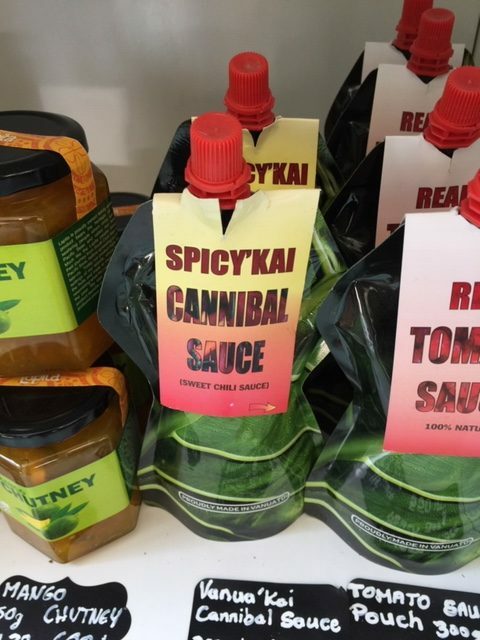 In the distant past, Vanuatu had a history of cannibalism, which is occasionally reflected in products on sale in local shops. Some eighty-two islands comprise Vanuatu, of which about sixty-five are inhabited. There are over one hundred languages, of which around ninety are still in use. All this in a population of a quarter of a million. From 1906 until independence in 1980 Vanuatu was an Anglo-French condominium. 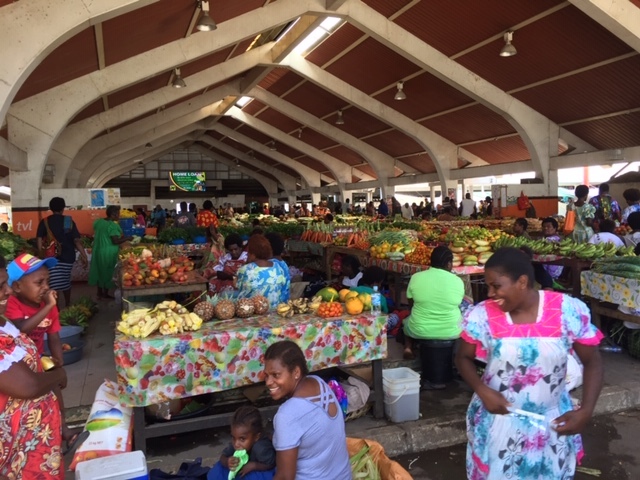 The official languages today are French, English and Bislama, a creole language. Even today, schools are either Anglophone or Francophone, although Bislama is spoken as a mother tongue for the first three years. I have met a family in which one daughter attends a French school and the other an English school. 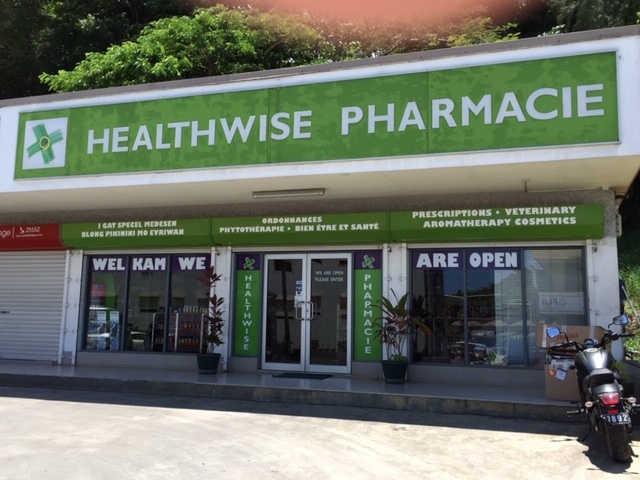 This pharmacy advertises its services in all three languages. The word for ‘child’ in Bislama looks politically incorrect to the outsider’s eye, but is polite and in everyday use in Bislama. Bislama is an interesting language. It is easy to understand and learn. It helps to say the words out aloud to make sense of them. 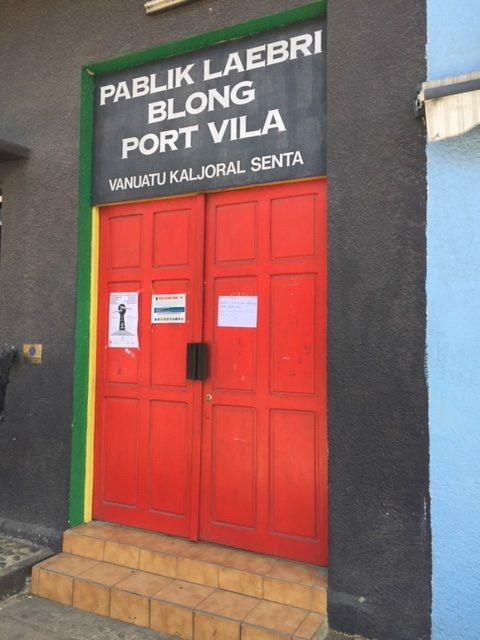 The public library sign is also in Bislama, above a door frame painted in the national colours. 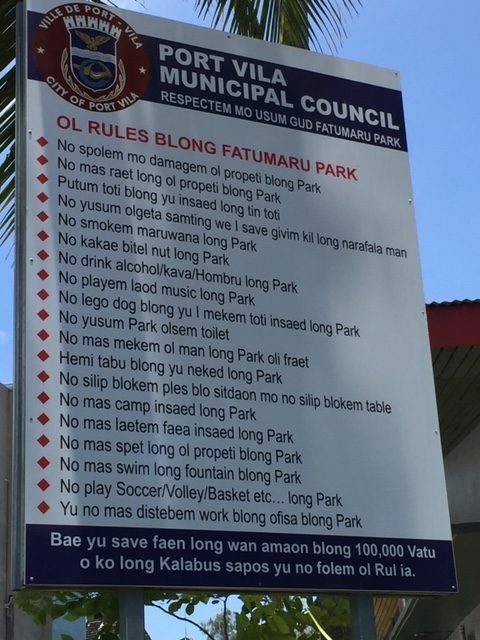 I found these signs in local parks amusing, both for the Bislama wording (translation conveniently supplied in the second of the two) and the list of interdictions. 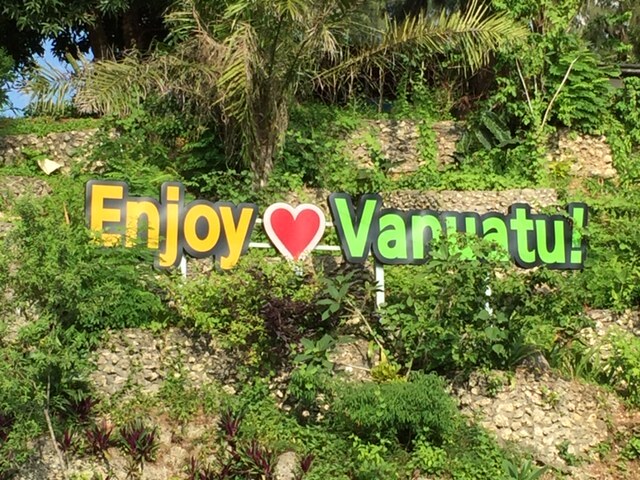 Tourism is fairly low key in Vanuatu. Most visitors come from Australia or New Zealand,with many visiting just for the day from enormous cruise ships which visit once or twice a week. 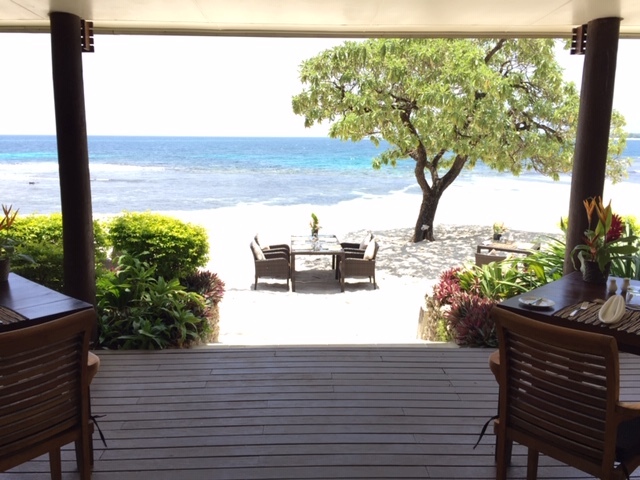 There are some beautiful small beachside resorts, this one at Eretap, just twenty minutes outside of Port Vila. 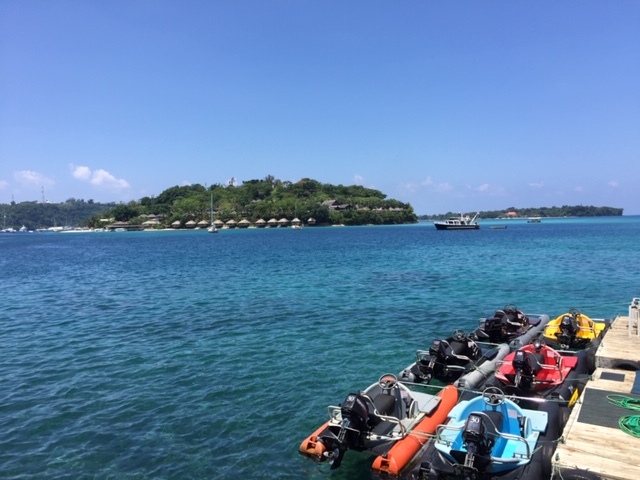 The resort is built on land owned by the local village and provides employment for many of them, as well as opportunities for guests to visit the unspoilt village, which I have described in a previous post. 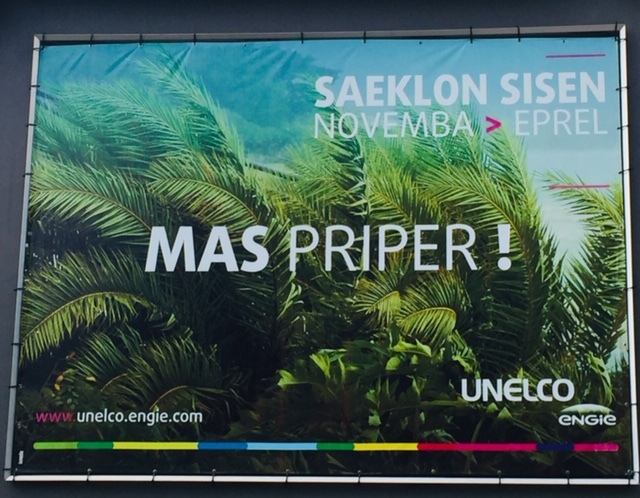 I was impressed with this advertisement in the centre of town, inviting people to spend a day with local people in their village. This is good, sustainable tourism and provides income and employment for local people. 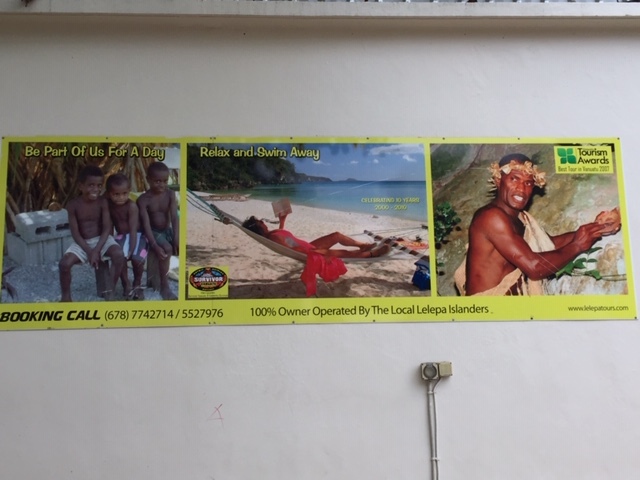 Life is not all bliss for these happy islanders. 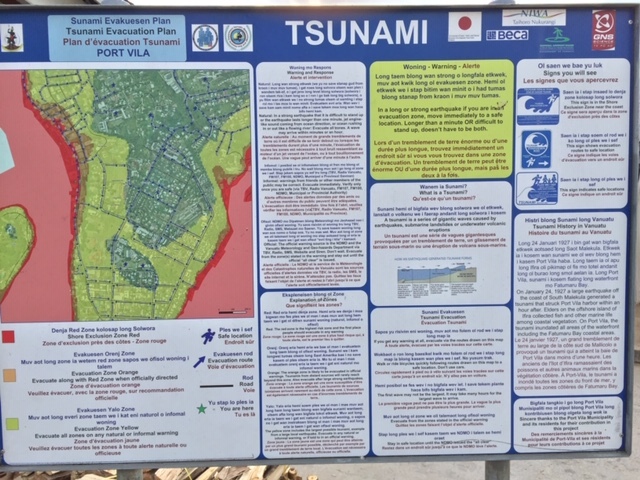 Earthquakes are common, with the risk of tsunamis (my partner witnessed a minor tsunami the day after I left). The cyclone season runs from November to April. In march 2015 Cyclone Pam devastated the island, with wind speeds of up to 250km per hour. It was a miracle that only eleven people were killed. 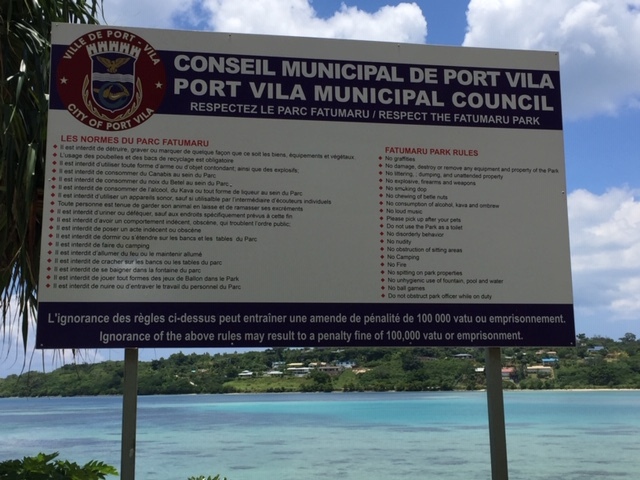 Since then, warning systems have been improved to advise escape routes and to encourage people to prepare for the cyclone season (‘Must prepare’, the sign urges). For me as a visitor, the seasonal risks are much outweighed by the climate and views, in particular the changing colours of the sea and sky through the day.